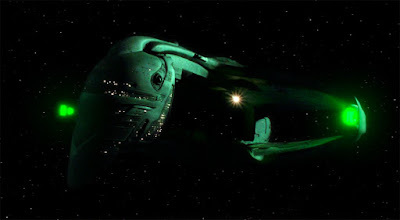 "All that's left now is Romulan. Never doubt that." Admiral Sela, +1 captain skill and an effect that prevents the use of battlestations and scan tokens when her ship (or the ship using the action) is attacked. This is an excellent ability, as it negates the one thing you can use to get quality attack dice against Romulan ships - battlestations. She doesn't have an elite talent slot however, so I'm thinking that the captain version of her would be better, with mybe Mendak acting as Admiral. Sela's Warbird itself is a very nice ship, its ability allows you to perform a double sensor echo at the cost of flipping over your cloak token. This gives you an excellent trick up your sleeve to get out of any tricky situation. Combine it with someone like Thei who gives you a free cloak action and you could land up in a completely different area of the board after two turns. The first elite talent, Klingon-Romulan alliance allows you to re-roll defence dice as a discard. There are better uses for 4 points. Tokath is a nice 2 point discard that enables 2 other upgrades. Always useful if you have the spare points. So, until next time, thanks for having a look!